The western Arkansas town of Fort Smith grew up around a frontier fort of the same name. In the early decades of the 1800s, increasing numbers of Cherokee and Choctaw migrated to the area from the east, fleeing incursions by white settlers upon their lands. These newcomers soon drifted into conflict with the native Osage and Quapaw peoples. In an attempt to manage the relationships among the competing nations, military engineer and explorer Major Stephen H. Long established a fort at the junction of the Arkansas and Poteau rivers in 1817. A group of traders, trappers, and opportunists began to develop the small settlement adjoining the fort. Although the first fort only lasted until 1824, the population of the accompanying town continued to grow. Throughout the 1830s, thousands of Native Americans passed through the region along the Trail of Tears, which ended in the adjoining Indian Territory. Sitting at the very edge of the still loosely organized “Arkansaw Territory,” Fort Smith functioned as a border town, replete with a panoply of vices, villains, ill-gotten gains, and fast fortunes. Indian traders and merchants did a brisk business with the neighboring tribes, while prostitutes, gamblers, and thieves cornered their own share of the proceeds. Fort Smith presented newcomers with great risks, but also the potential for large rewards. Before long, Jewish settlers and entrepreneurs arrived to test their mettle in the unforgiving town. The earliest known Jewish settler, Edward Czarnikow, arrived in Fort Smith in 1842 from his home in Posen, Prussia. Czarknikow quickly earned the trust of prominent local chiefs and tribesmen, and became one of the most successful Indian traders in the area. Another early Jewish merchant, Isaac Cohn, settled in Fort Smith after losing his store in Pine Bluff to fire. In Pine Bluff, he had earned some notoriety for opening up his store to African American customers, and in his new home Cohn again forged close and valuable contacts across a broad cross-section of Fort Smith society. The 1880 census lists him as living with his first business partner, an Irishman named Daniel Harrington. Like Czarkinow, Cohn developed close ties with the Indian leadership, particularly among the Choctaw, and prominent members of the tribe often met for dinner at the Cohn household. One of these visitors, Green McCurtain, became a close business associate of Cohn’s for many years. McCurtain served the Choctaw Nation in a number of capacities, as sheriff, a member of their house of representatives, treasurer, and ultimately as their chief. Cohn prospered from his connection to McCurtain, in part by cashing checks sent by the federal government to the Choctaws. Cohn also supplied much of the merchandise purchased with these government payments. 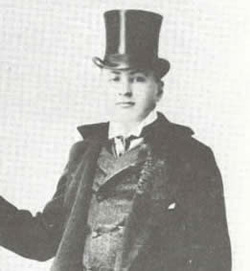 By the time of Cohn’s death in 1899, he was reported to own a fortune valued in the millions of dollars. Perhaps the most ambitious of the early Jewish traders, Mark Stuart Cohn profoundly influenced the development of both Fort Smith and the region. Born in Germany, Cohn arrived in Fort Smith in the 1870s and busied himself with a number of ventures. Cohn and an Indian partner bought a ranch on the prairie near Forth Smith and developed a large gravel quarry on the property. They supplied gravel to the railroad lines expanding through the region and even built their own rail line to transport gravel from the quarry. Unsatisfied with a single successful pursuit, Cohn also operated trading posts in Arkansas and the Indian Territory, as well as general merchandise stores in Fort Smith. He was instrumental in the merging of the Indian and Oklahoma Territories into the new state of Oklahoma. When the ensuing land rush began, Cohn led the way, filing the first homesteading claim in the state according to some accounts. The success of the early pioneers encouraged many others, and the Jewish population grew rapidly in the final decades of the nineteenth century. As the town saw an influx of new Jewish arrivals, both recent immigrants and longtime citizens relocating from other areas, a succession of Jewish organizations began to take root in the town. In 1871, residents joined to create Fort Smith’s first Jewish institution, the Cemetery Association. Edward Czarnikow served as one of the association’s officers. The following year saw the formation of the Hebrew Ladies’ Benevolent Society, a charity organization. A local chapter of B’nai B’rith was founded in 1878, and in 1886 residents established a congregation, United Hebrew Congregation. A large synagogue was built in 1892 and Dr. Abe Traugott served as the first full-time rabbi. Jews also formed a social organization called the Progress Club in 1892. When George Tilles became the president of the Progress Club, he pushed for the erection of a clubhouse. In 1912, they completed a three story building on North Sixth Street, which cost the sizable sum of $45,000. George Tilles became so well known that he received out-of-state letters simply addressed to “George Tilles, Arkansas.” His father, Louis Tilles, served as a federal soldier stationed in Fort Smith during the Civil War and decided to settle in the town after the war. Louis died unexpectedly in 1875, and fifteen-year-old George and his four siblings were placed in a local Catholic orphanage. As news spread of the Tilles family plight, Jewish families in the community stepped forward and took care of the young children. George founded his first business, a cigar factory, at age sixteen, and in the 1880s established the town’s first telephone exchange. He worked as secretary-treasurer and editor of the Fort Smith Tribune and managed the Fort Smith Opera House. An active Republican, Tilles ran for a seat in the state senate and carefully followed developments in local, state and national politics. His passion for Fort Smith history led him to establish the Fort Smith Pioneer Club, and he penned a history of the town from the Civil War era through the turn of the century. In the early-twentieth century, the Jewish population in Fort Smith continued to grow as immigrants from Eastern Europe began to arrive in increasing numbers. In 1905, 179 Jews lived in Fort Smith. By 1937, 350 Jews lived in town. In 1913, a group of Eastern European Jewish immigrants established an Orthodox congregation named B’nai Israel. The founding congregants included a young boy of fifteen named Louis Kastin, a Russian immigrant who lived with his brother-in-law Abe Katz and his family. At the time, Kastin worked as a salesman at a clothing store, but soon entered the insurance business and emerged as an important leader of the small Orthodox group. The congregation persisted through the 1930s when their numbers dwindled, at which point remaining members contributed their Torah scrolls to the United Hebrew Congregation and joined the larger congregation. Kastin threw a similar degree of enthusiasm into his new community, and spent the remainder of his life as a dedicated and active member of UHC. Many of the Eastern European Jews who arrived in Fort Smith in the early 1900s achieved rapid and remarkable success. Iser Nakdimen immigrated to America at age fifteen from Grodno, Russia, with only a few cents in his pocket. He worked at a variety of menial tasks in New York state and Chicago before making his way to Fort Smith in 1894. With his savings, Nakdimen opened an overall factory and soon expanded into banking. By 1914, he owned a total of nineteen banks in Arkansas and Oklahoma. Nakdimen distinguished himself for his generosity, both to his own workers and the larger society. At his overall factory, he shared the profits with his employees and in 1901 he doubled all wages. When banks began to fold during the panic of 1907, Nakdimen made risky loans on cotton crops to hard pressed farmers, and earned a handsome return on his generosity when cotton prices rose soon after. During both world wars, Nakdimen lent money to servicemen on their word, helped students pay for higher education, and contributed to the needy. Nakdimen even bailed out the State of Oklahoma by purchasing for $1.75 million dollars in building bonds raised to generate funds for public structures. A fervent opponent of monopolies, Nakdimen often contributed editorials on the subject which were frequently quoted by like-minded U.S. senators and congressmen in Washington. The prosperity of the local Jewish population and the town of Fort Smith grew in tandem. 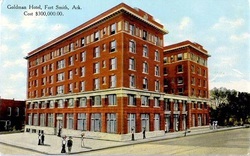 Jacob Goldman, an Arkansan cotton broker based in St. Louis, provided the funding for Fort Smith’s palatial hotel complex, the Goldman Hotel. Opened in 1911 at a total cost of $300,000, the ornate edifice of cast iron, concrete, marble, and fine oak served as the preferred gathering place of Fort Smith’s elite for decades. The building offered an elegant dining room with tuxedo-clad waiters and luxurious accommodations for the well heeled and well known. Business began to wane in the years following World War II and the hotel finally closed in 1974. This important Fort Smith landmark was demolished in 1994. The vibrant Jewish life of the early-twentieth century began a gradual decline along with the Fort Smith economy in the years following World War II. In the 1950s, UHC members sold the original building and moved to a new synagogue and community center, but even this more modest space soon proved to be larger than the dwindling population needed. Through much of the century, the Fort Smith community received a small boost in membership from Jews living in Fayetteville and other neighboring towns, who traveled to the UHC synagogue for holiday services. These small numbers could not compensate for the loss of longtime residents, and the community gradually aged as their children moved away to seek opportunities elsewhere. Louis Kastin passed away in 1976, leaving his widow, Sarah, as the final living member of the Orthodox congregation. In the 1980s, the loss of manufacturing jobs and a drop in oil prices exacerbated Fort Smith’s decline. As of early 2017, UHC had approximately fifty members. The remaining congregants maintain weekly services but face challenges due to their dramatically diminished numbers.